Buckwheat is a pseudo-cereal and therefore gluten-free. Hence, buckwheat serves as cereal replacement mainly for people with celiac disease. 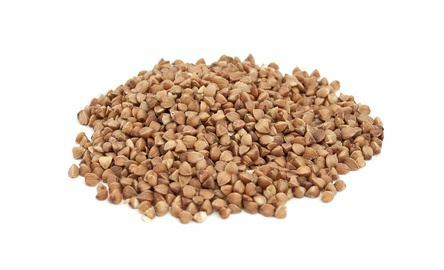 Buckwheat is perfectly suitable for soups, patties, dumplings or pancakes, you can add it to muesli or bake it in tarts and many other cakes.. The buckwheat plant can grow up to 60 cm high, it belongs to the family of Polygonaceous plants and is originally from Asia. Today it is also grown for example in the US and Canada. The edible seeds were called buckwheats because the shape resembles beechnuts and the use cereals (wheat). The three-corner shaped seeds develop out of white-pink blossoms; their hard shell is usually removed before sales. Buckwheat contains a multitude of essential amino acids, for example lysine, arginin, and tryptonphan, the vitamins B and E, and mineral nutrients such as potassium, calcium, magnesium, phosphorus, and iron. Noteworthy is also the content of the colouring agent rutin, an important flavonoid.